One strike, and you’re out. The adage is clear in its meaning: Commit one fault, and forget about a second chance. The one-strike policy, championed during former President Bill Clinton’s State of the Union address Jan. 23, 1996, was intended to crack down on crime and drug activity in public housing. When the U.S. Department of Housing and Urban Development issued a set of guidelines that year, local housing agencies were given the power to adopt their own version of the policy. In some cities, a criminal arrest meant the tenant was issued a notice that their lease would be terminated, like in Chicago. But in other cities, like Kansas City, Mo., measures were put in place to vet the cases prior to the tenant facing eviction. That way, only the “bad actors,” people committing crimes, were being evicted, and not whole families. The Housing Authority of Kansas City operates that way. Tenants agree in their lease to notify the property manager if someone whose name is on the lease, or a person under the tenant’s control, is involved in criminal behavior. The act of having reported the activity can be used in the tenant’s defense if the case goes to civil court. Tenants can also make a case that they had no prior knowledge of the criminal activity. “The policy protects a lot of innocent people who would have normally been evicted because of the actions of someone in the household when they didn’t have any responsibility or knowledge of it,” said Julie Levin, managing attorney of the central office of the Legal Aid of Western Missouri. When any household member or a guest has been charged and convicted of a crime, the head-of-household is questioned on whether he or she knew or should have known about the activity, Levin said. The Legal Aid of Western Missouri was able to negotiate this tenant protection in the leases in 1993 when the housing authority lost some of its oversight authority because of mismanagement. After that, crime decreased significantly, which Levin attributes to tenants having more ownership in the development under new management. 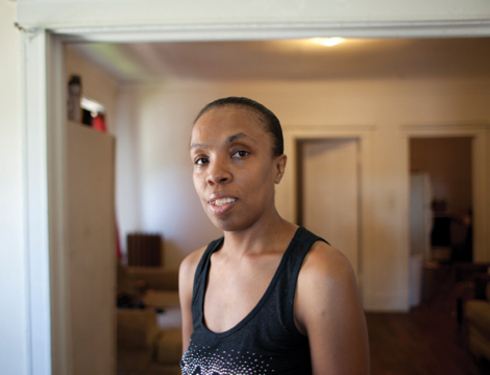 “Crime in Kansas City proper is higher than crime in Kansas City public housing,” she said. Levin said that her group uses police reports and statements from the public safety department of the housing authority, which investigates criminal activity, and talks to witnesses to find out about the crimes that occurred. The research helps weed out bad tenants and bolsters cases of innocent tenants, she added. “It’s a very subjective thing, and we just gather whatever evidence we can that proves [the tenant] had no knowledge of [the crime.] They could have engaged in this criminal activity at school, and grandma wouldn’t have seen or heard about it,” she said. The State of Minnesota has a policy similar to Kansas City’s, said Lawrence McDonough, managing attorney of the Housing Unit at the Legal Aid Society of Minneapolis. He said that such a provision is better because it focuses on whether a tenant “is really a bad actor or not,” he added. The Legal Aid Society of Minneapolis provides legal help to low-income residents of Hennepin County. McDonough has successfully defended many cases where the tenant had no prior knowledge of criminal activity occurring on- or off-premises. “I think that is the proper or moral way to go because it’s focusing on the culpability of the individual rather than if the individual is at the wrong place at the wrong time,” he said. McDonough said he cannot exactly pinpoint the effect of the innocent tenant defense for drug cases, which are the most common type of one-strike case. However, he said he’s won more of the drug cases than he’s lost when the situation called for the innocent tenant defense. While the statute exists, the Minneapolis Public Housing Authority tends to give eviction notices for illegal drugs on the property despite the circumstance, McDonough said. The Minnesota Legislature is looking out for the interest of the innocent tenants. “The public housing authority in Minneapolis isn’t looking at this any differently, but they are subject to the laws created by legislators above them, including the Legislature of Minnesota,” he said. Even if a tenant has committed a crime, the federal law gives all housing authorities the discretion not to evict a tenant even when the tenant has violated the lease. “The lease provisions do not require eviction; they allow eviction. The only type of possession of an illegal drug in which it is absolutely mandatory is meth,” he said. Thus, there could be multiple housing authorities within the country using the discretion not to evict someone. It is difficult to quantify the number of housing authorities that are exercising it, McDonough said. The compassionate intentions of the congressmen who wrote the provision were not written into the actual language of the law, McDonough said. Congressional reports cite the congressmen saying that they believe the provision should be practiced in a compassionate way that does not evict innocent tenants, McDonough said. McDonough would like to see innocent tenants across the country receiving the same amount of consideration. This would require federal action for equal protection across the board. If a CHA resident is arrested one time, the tenant is sent to eviction court. But a Chicago Reporter analysis found that the policy separates families and ousts some who were never convicted of breaking the law.